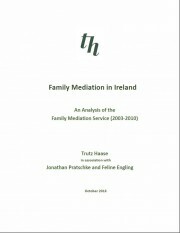 The study analyses the short-term impacts of the Family Mediation Service. It does not attempt to evaluate the operational aspects of the FMS or its regulatory environment, nor can the study offer a statistical analysis of the role of family mediation within the wider context of marital and relationship breakdown. Nevertheless, the results are very interesting, shedding light on the characteristics and expectations of couples who enter mediation in an attempt to resolve their conflicts and documenting the achievements of the FMS over the past decade. The results of the analysis draw strength from the large number of observations in the dataset: 4,210 matched records containing information on participants at the beginning and at the end of the mediation process. The study situates these results in a wider context by reviewing the international literature on family mediation. This reveals the similarities and differences that exist between the work of the FMS and similar organisations in other countries and highlights areas where further research is required in order to obtain a better understanding of the strengths and limitations of family mediation. In this summary, we review the key findings of the study and provide recommendations regarding procedures for data collection in the future.